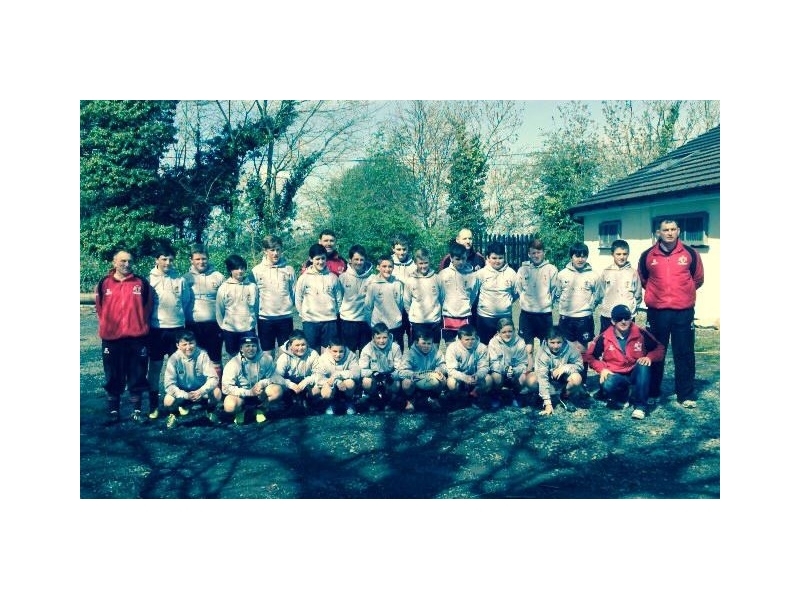 Last Sunday saw the two U13 teams playing for Leinster titles in the league. The Black team ran onto the pitch for a 12:15 kick off in Division 2 against a very physical Edenderry side. During early exchanges in the game, Tullamore got to grips with this powerful side and competed extremely well at the breakdown. Tullamore coped very well around the fringes with Edenderry’s attempt to batter the ball down the centre. Little headway was made by either side at this stage of the game but Tullamore’s change of tactic of kicking ball behind the Edenderry defence started to pay dividends culminating in a well-earned try by Ryan Strong. Tullamore reset their defence for the Edenderry kick off and handled all Edenderry could throw at them, making some breaks themselves through their kicking game. All looked well for Tullamore heading towards the half time whistle but a break by Edenderry allowed them over the Tullamore line and a subsequent easy conversion kick. On the stroke of half time, Tullamore were dealt another blow with another Edenderry converted try. The half time scoreboard did not reflect the true nature of the contest in the first half. Tullamore needed a fast start to the second half but unfortunately were once more sucker punched by an Edenderry try in the first five minutes of this half. Tullamore battled on against this very physical Edenderry side but sport can be cruel and the more they battled, the more Edenderry found holes in the Tullamore defence as they tried to claw their way back into this game. Tullamore fought to the end with 23 panel members giving 110% but conceded two more tries. Each member of the panel and their coaches should be very proud of the year they have had. 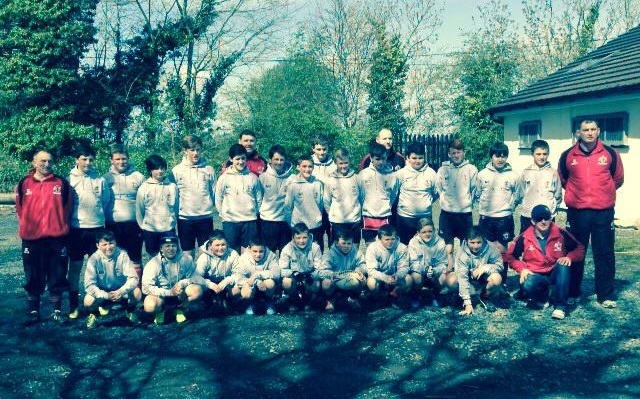 The commitment shown by all concerned has been outstanding throughout the year and these young men are a credit to not only their coaches, but to their parents and club also. Congratulations to Edenderry on winning the title. The second match of the day saw the Red Team taking to the pitch at 2:45 in the Premier Division against Boyne. This eagerly awaited match saw sides meet for the second time in a week with Tullamore grabbing the spoils on the previous occasion. The game was played at a high tempo from the outset with neither side prepared to concede anything to their opponents. Tullamore got off the mark with a well struck Luke Egan penalty after 12 minutes of play. Boyne hit the front with an unconverted try followed five minutes later with a penalty. Tullamore battled bravely and a great individual break by James McGivern saw him touch the ball down under the Boyne posts despite close attention by several of the Boyne defenders. Luke Egan converted this try leaving the scoreboard 10-8 in Tullamore’s favour heading for half-time. McGivern wasn’t finished in this first half as a clean take from kick off brought him once again towards their line with no Boyne defenders laying a hand on him. This was once again converted by the boot of Luke Egan and the half-time scoreboard read 17 – 10 to Tullamore. In the second half, Tullamore picked up where they left off, pressing hard at Boyne’s defence. This was rewarded when Dylan McDermot grabbed a five pointer and the dependable Luke Egan added the extras. Tullamore were cruising at this stage of the game and Boyne appeared to have no answer but a fine individual break away try by the Boyne inside centre gave his team seven points and a renewed vigour. Tullamore were still in control of this game but against a rejuvenated Boyne team. After a further five minutes, a well kicked Boyne penalty left only a six point gap and a Boyne team with their tails up. Both teams battled hard with Tullamore unable to capitalise from line-out balls and in most cases, giving initiative to Boyne. Boyne, for their part, pushed hard and stretched Tullamore’s defence on more than one occasion but Tullamore seemed to be doing enough to stem this tide. With the clock apparently against Boyne, it appeared like it was going to be Tullamore’s day but as can be the way, the referee’s whistle didn’t sound except for a series of penalties to Boyne, the last of which was five metres out from Tullamore’s posts. Boyne lined up their big forwards and were stopped squarely by Tullamore’s pack but a fortunate quick recycle for Boyne exposed a hole that was gladly accepted by Boyne. The resulting conversion put Boyne ahead by one point and the final whistle was the cruellest thing the Tullamore players heard all day. While it is hard on Tullamore players and coaches to lose in this fashion, we must compliment Boyne’s commitment and determination and ‘never say die’ attitude that left them Leinster League title holders. This was a hard lesson for Tullamore but hopefully one that will stand to them next weekend in the Cup Final in Donnybrook. Good Luck Lads!